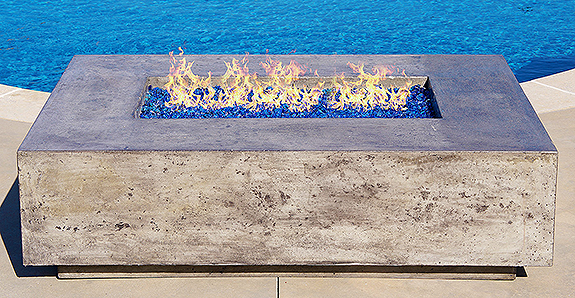 Shop our outdoor fire pit tables for your patio, deck, and outdoor living space. Fire pit tables are a great way to enjoy the outdoors, benefiting from the warmth the fire tables provide. 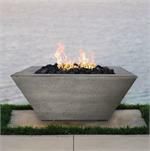 Our artisan fire pit tables are hand crafted and made in the USA . Our fire pit tables all come with the option of a stainless steel pan and burner that can be used with either natural gas or propane. 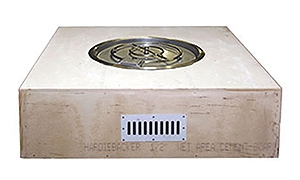 For propane applications, you can supply your own LP/Propane from a portable tank and make the Ultimate Fire Pit for Outdoor Entertaining in Style. 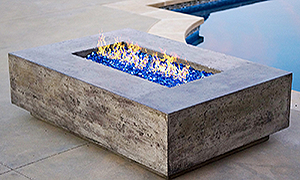 To ensure a designer look, purchase any color of genuine Diamond Fire Glass ® to finish your fire pit table. The fire glass crystals will reflect and sparkle in the daylight sun as well as at night time while flickering in the fire. 45" x 18" Unfinished Fire Pit Enclosure with 25" 150 BTU Electronic Fire Pit Insert. 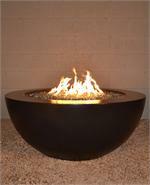 45" x 18" Unfinished Round Fire Pit Enclosure with 25" 150 BTU Electronic Fire Pit Insert. 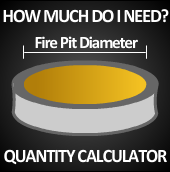 45" x45" x 18" Unfinished Square Fire Pit Enclosure with 25" 150 BTU Electronic Fire Pit Insert.